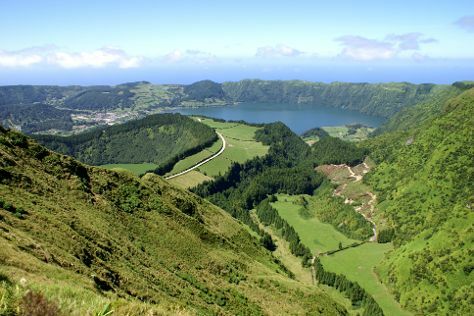 Known as The Green Island, Sao Miguel is the largest of the nine islands of Azores and is considered a natural paradise. These islands were discovered in the 15th century and, according to myth, are reputed to be part of the lost empire of Atlantis. Sao Miguel's most prominent feature is a set of twin lakes, one of which is blue and the other green. Visitors also enjoy the island's park, golf courses, beaches, mountains, marina, and ocean views. Stop for a look at the city's monuments and architecture, and experience the cobbled streets lined with a variety of restaurants, shops, bars, and cafes. Sao Miguel is in Azores. Take a peek at our world travel planner: Sao Miguel and its charms laid bare and easily scheduled.